I've written about the Salvation Army before, in the appropriately named entry, The Salvation Army - To Give, or Not to Give?. Now, I have reservations about that organization, and I've personally decided to donate to other, more deserving groups, but as I wrote in that entry, "I do think the Salvation Army does much more good than harm. So, if the only way you would donate would be to drop your change into one of their kettles, then don't hold back! Most of your money will go to helping people, and it's better than doing nothing at all." I certainly wouldn't advocate hostility towards the group, but here's an example of a Christian who was none too happy with one of the bell ringers, Salvation Army bell ringer says 'Happy Holidays' led to assault. Yes, you read the headline correctly. The bell ringer was wishing people 'happy holidays', and was assaulted because of it. Here's how she put it. "The lady looked at me," said Vindiola. "I thought she was going to put money in the kettle. She came up to me and said, 'Do you believe in God?' And she says, 'You're supposed to say Merry Christmas,' and that's when she hit me." How petty and small minded can you get? Here's a person volunteering their own time to collect money for a Christian organization helping the poor, and another person is angered to the point of violence over their choice of wording in well wishing? It's absurd. And it's not even like saying 'happy holidays' is always (or even usually) a deliberate downplay of Christmas. I remember when it used to be the standard greeting on Christmas cards in lieu of wishing 'Merry Christmas and a happy New Year' simply because it was shorter. Or do these people hate New Year's so much that only Christmas should be mentioned in holiday greetings? Granted, some people do say 'happy holidays' deliberately to avoid only Christmas wishes, because there are other holidays that people celebrate around this time of year. But that's meant to be more inclusive to those other people, not as some sort of hostility towards Christians. What type of person does it take to get upset at somebody extending good will towards a larger group of people? 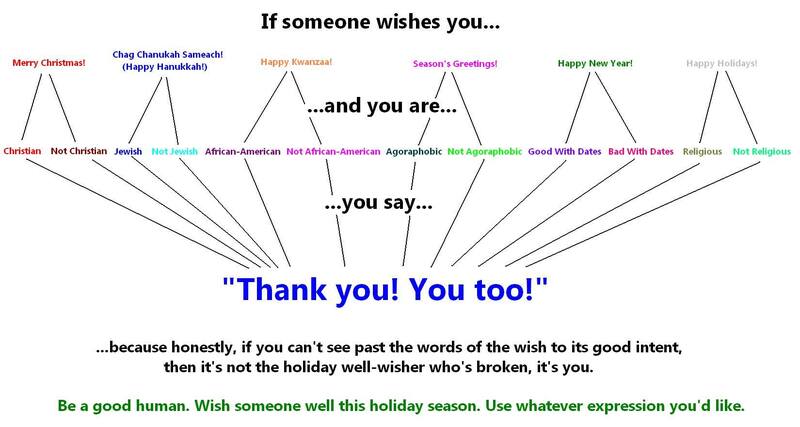 It's kind of ugly, but here's a good chart I came across showing the proper response to different holiday greetings depending on the particular affiliation of the people involved. ...because honestly, if you can't see past the words of the wish to its good intent, then it's not the holiday well-wisher who's broken, it's you. So, happy holidays to everyone out there who's celebrating some sort of holiday right around now. And if you're not celebrating anything, then just have a nice day.